Elastomer Membrane Switches are used everyday in remote controls and cell phones. If a silicone rubber keypad is used as the graphic layer and/or membrane layer it would fall in this category. One way to distinguish between two different methods of creating a tactile response is whether or not the tactile layer is caused by the elastomer itself or from something beneath the rubber layer. If the elastomer is both the membrane layer and the tactile layer means the tactile response is internal to the keypad. If the elastomer is the graphic layer only, and the tactile response is from metal dome, polyester dome or packaged membrane then it can be refereed to externally tactile keypad. Elastomer membrane switches can have a flex static layer or rigid static layer (PCB). 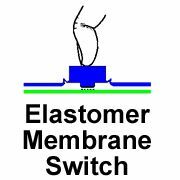 The simplest elastomer membrane switch is made with two layers using a decorative elastomer internally tactile over a PCB.